what if the lines indicated in the picture were a more gold color, with red eyes, less white in the tail? And can you order the royals from most expensive to least? L27, L190, L191, L330, L418 did I miss any? L-190 or maybe 330 hard to tell at this size. This fish looks malnourished or it could be sick. I don't get your question about the lines, tail, or eyes. cheapest are L190,330,191,90 but only when small and price can vary on patten and quality of the fish. yah, i agree with jackson...the fish looks hungry. throw some wood in there and some veggies. I think its a l190. Well, everbody learns from mistakes. 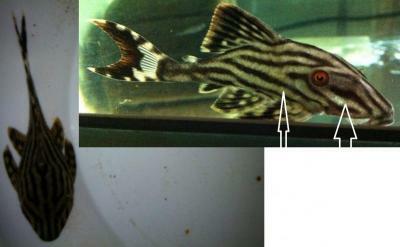 Next time when you buy a pleco, make sure to check it does not have sunken eyes, sunken stomach etc. Good luck!!! I took it back, got half the amount store credit back from big als scarborough. Could have argued that it was a sick fish, but I didn't bother. Ah well, learnt something.